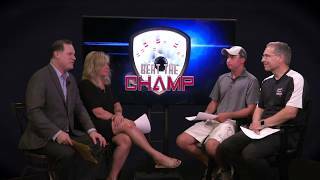 Dana Voytovich, BA ’18 Bowler and Pin Chaser, Sparetime Bowling Center, Cheektowaga, N.Y.
Dana Voytovich on "Beat the Champ," winning the 2018 George A. Obenauer Masters Championship. For most people, graduating from college is achievement enough for one weekend. Not for Dana Voytovich; the day after obtaining his BA in business administration from UB, he won a bowling tournament, the George A. Obenauer Masters Championship in Cheektowaga, N.Y., worth $2,000. Of course, much like a college degree, this accomplishment didn’t come out of nowhere. “When I was in middle school, I would watch my uncle bowl,” says Voytovich, “and after his first game or so, I’d go get my own pair of lanes to practice by myself.” He started out using his signature two-handed throwing style because the ball was too heavy for him, but after the technique was legitimized by PBA star Jason Belmonte, he decided to keep it. It’s hard to argue with the results. After waiting until his senior year to join Cheektowaga Central’s high school team, he found immediate success, qualifying to compete for the New York State championship. During his time at UB, he won a couple other local tournaments as well. We asked Voytovich for five tips on how beginning bowlers can improve their scores. Rather than aiming straight at the head pin (aka the 1 pin), a right-handed bowler should aim between the 1 and 3 pins, which is just to the right of the head pin. This is called the pocket. A perfect strike ball hits the 1 and 3, 5 (behind the 1) and 9 (behind the 3). If you don’t curve the ball, it’s easier to do this by bowling from the right side of the lane rather than head-on. Every time you get a spare, that’s worth 10 more pins, so converting spares is important. A common spare that’s fairly easy to convert is the lone 10 pin, which sits in the back row, on the right. You want to stand on the left side of the lane and go at it diagonally, rather than straight up the right side. Whether you’re buying a ball or looking for one at the bowling alley, find the heaviest ball you can handle. The heavier your ball is, the less it will be deflected by the pins. You want the ball to take as straight a line through the pins as possible. Concentration is key. One good way to stay focused is to have a pre-shot routine. Before every shot, I clean the ball with a towel, put my foot on the ball return and use the blower to make sure my hand is dry. Find whatever works for you and repeat, repeat, repeat. This is less related to scores, but who wants to use smelly shoes that everyone else has put their feet in?